Cult of Tech.net - Page 5 of 5 - What? This is suppose to be witty? What? This is suppose to be witty? When it comes to software providing a feature or function that’s broken is worse than not providing the feature at all. Let me weave the story of broken functionality from this weekend. Google’s Apps for Domains provides 2 ways to reset your administrative password, either you have an alternative address configured and a check-box checked allowing Apps for Domains to reset your password using that address. Alternatively, if you missed that configuration option you can go though an alternative process that involves creating a DNS record with a value provided by Google to verify that you own the domain. From what I’ve gathered, the functionality is suppose to work like this; you create a CNAME record with a value provided by Google and point that at google.com. Google’s system is then supposed to look up that CNAME record and verify that it points to google’s domain. If it does, the instructions for resetting your password are sent to the email address you provide when you go though the recovery process. The problem is, the system is broken right now. What should happen, and what’s actually happened are two different things. In reality I’ve received 2 automated responses form Google indicating that the system couldn’t verify the CNAME record. After searching the Google Apps support forums it turns out that the CNAME method is currently broken and that Google is aware of the issue but hasn’t bothered updating anything on their site to note that or temporarily disable the function. Since the functionality was present and failed in the same way one would expect it to fail if you had simply configured something wrong the result is spinning your wheels with no results. If Google had disabled the functionality or provided a link to their support request system in the resulting email, I could have at least opened a ticket after the first failure instead of going though the process again double checking everything. the least they could have done was provided a link to their support ticketing system. The worst possible thing to do to a customer is make it look like their spinning their wheels. In this case at a minimum the auto-reply email for a failure should include a way to open a ticket on the issue instead of just sending you back to the same process with a generic error. The moral? If you’re a developer and you realize that some functionality you’re providing isn’t functional, disable it until you’ve fixed it. If that means you have to deal with more support tickets for a while so be it. This is even more important in a customer service situation like resetting a password. Needless to say, if you use Google Apps for Domains and your administrator account doesn’t have a secondary email address that can be used for resetting the password, set that up post haste. On top of that, it might not be a bad idea to create a second administrator account with a long random character password that’s stored in a safe place. With a second admin you could use that to log in and reset the primary admin account’s password as well. Windows 7 never ceases to amaze me. I recently brought up a Win 7 Home pro box using, some pretty archaic by modern standards hardware. While not the most stellar performer, it does surf the web well enough and considering that was it’s intended mission I’d say it’s been successful. I was utterly impress that not only did everything work, but everything was detected and worked right out of the box. Even installing to the SATA controller which was always a problem for Windows XP. Though I guess I really shouldn’t be so surprised by 9 years of OS development. None the less, the real concern was performance. Of which the machine scores a blister, okay not really, 3.2 on the Windows Performance index. The limiting factor actually being the CPU. I don’t know what I found to be more surprising, the fact that all the old hardware worked under the new OS or that the system is just as usable with more features and better security as XP SP3 was on the same hardware. One of my favorite features in Windows 7 (I skipped vista so it may apply there too) is Sticky Notes, the virtual version of their 3M counterparts. I use them mostly the same way too, which means sometimes I want to strike out a completed task instead of simply deleting it from the note or deleting the note. The solution to the quandary came from a fellow on twitter. Who knew twitter could be helpful? 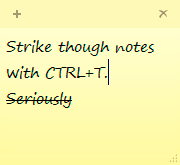 In a sticky note, select the text you want to strike out and and press CTRL+T. Bam! Stuck out text and you don’t need a tablet and pen to draw a line though it. I’ve been using Alex King’s Twitter Tools for sometime now on some other Wordpress sites I’ve developed. It’s clean, simple and just plain works. However, one thing that’s never really thrilled me about twitter is its use of bit.ly or any of the other automatic URL shortening. Mr. King provides a bit.ly plugin that lets you use your own bit.ly API, so you can tract traffic though your link, but that’s only a minor improovment. The best solution, in my opinion is to use a custom short URL that’s provided though your own domain. This has several advantages, the biggest for me is that it makes it clear where the link is actually going. However, short canonical URLs are also being touted as a way to avoid massive internet link-rot created by the myrid of URLs services like bit.ly and tinyurl can produce. In fact I’m rather opposed to those services (even if I do use them) for security and clarity reasons. You can read more about rev=”canonical” urls here and here. Fortunately, running a custom URL shortening service on your own blog isn’t difficult. In fact there’s already a Wordpress plug-in that handles both the shortening and redirection. All that’s left for my purposes is tying that shortened canonical URL into Twitter Tools so that my tweets don’t get bit.ly or tinyurl links. Twitter Tools – to get the updates on twitter. Taking a quick detour from photography, I saw this on Video Sift the other day and after reading though the commentary (some of which were way off) I thought it was worth taking a few minutes to explain what’s going on, at least as far as I understand it. But first the video.